If your staff have regularly scheduled time where they aren't available, like a lunch break or afternoon tea break, then you can add Breaks to their working day. Breaks are added directly to the staff member's Normal working hours, so will be applied automatically for each day. 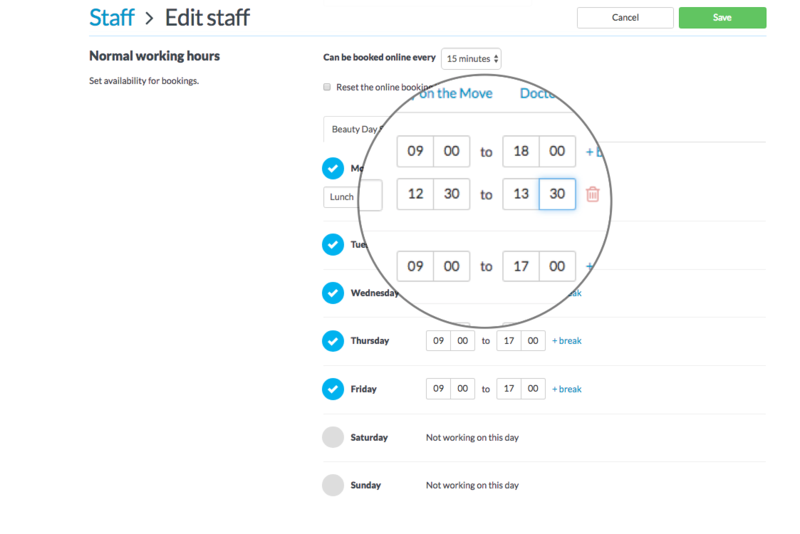 You will also be able to adjust the time of a break in the staff member's calendar, or remove it from a specific day, as desired. Add regular breaks to their working days. Update or reschedule a break. Remove a break from a staff member's day. Individual staff breaks are set by day, for each staff member. They are then automatically applied week to week. Head to Setup > Staff in the main menu. Click Edit next to the staff member you want to add breaks for. 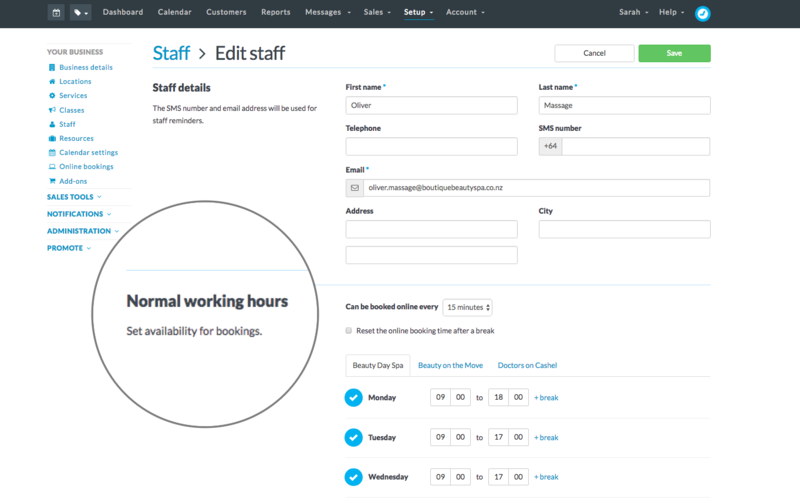 You can decide if you would like breaks to reset the online booking times when customers book online. 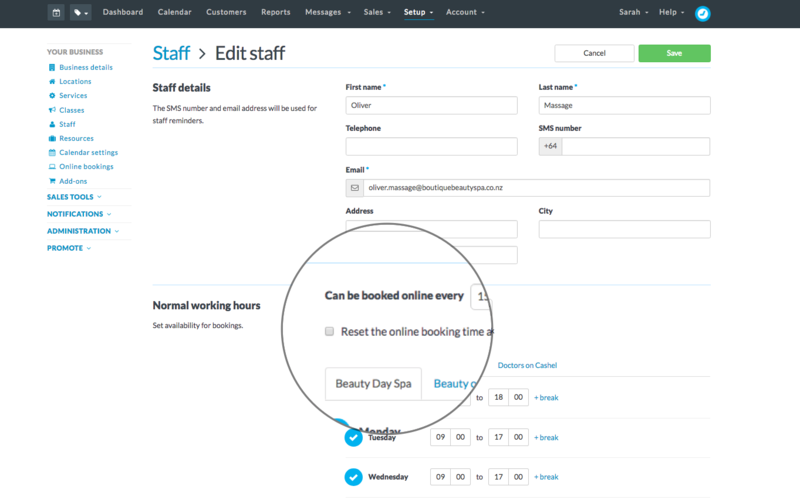 Check the box next to Reset online booking times after a break if desired: Find our more in our How to set online booking frequency guide. Type in the break name (e.g. Lunch), this will be shown on the calendar. Note: Online bookings will be blocked during this period, but you can book over them using the Calendar if need be. A warning will appear if you try to do this, but you can ignore it. 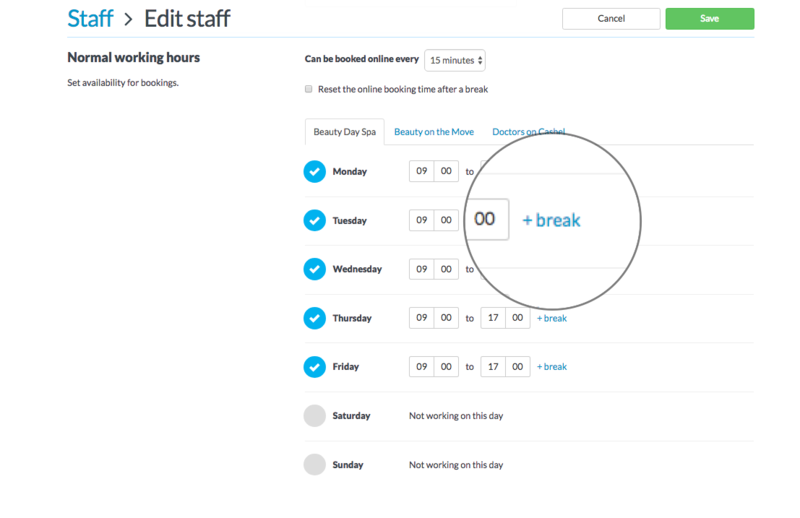 If the staff member's day needs to be adjusted, or they want to take their breaks at a different time than usual, you can update the time of the break from the calendar. Click on the break in the Calendar, this will pop up a window that shows the current details of the break. This will only update that single break in the calendar. If you'd like to update the break time for every day, you can update this in the staff member's Normal working hours (see above). If you want to remove a regularly scheduled break on a single day - without removing it from the rest - then you can toggle a single break off from the Calendar. Click on the break in the Calendar, this will pop up a window that shows the details of the break. Click Save to update and return to the Calendar. This will remove that single break from the calendar.